Custom Plans for Boat Shed with Tower? Im looking to build a carport for my 23LSV that will fit with the swim deck on and tower folded up. Anyone have pictures or plans for any customs sheds that look good?? I heard building a garage works very well, as long as you make the ceiling and garage door height tall enough and the building length enough to fit. Otherwise, I'd just get a portable garage instead. 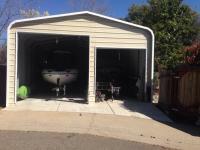 IF you're investing in a wooden or metal structure, I'd go with a full garage instead of making it specific for a boat, just seems more logical to me. It's kind of like building a shed for your lawnmower, but instead of just the lawnmower you can include all your gardening tools, landscaping materials, wheelbarrel, and much more. Just think about, wakeboards, life vest, boat accessories, and whatever you keep in your boat. Have you seen the forum, http://www.garagejournal.com? Pretty awesome place if your interested in things like garages, shops & carports. I've got about 4 sites that I spend WAY too much time on. TMC being the most time but garage journal is 1 of the 4. I just had a Metal Building thrown up in a day. Looks great. Very inexpensive. Holds my boat with tower up and my SxS. 21ft wide x 30ft Deep. 10x10 door and 8x7 door. About how much did that one run you?? How much clearance do you have while backing the boatin with the tower up to the top of the door? I am ddebating on something like that but wasn't sure if a 10' door would do it or if a 12' was needed. I just put up a Portable shed with the specs below. I put it with the help of my son in 6 hours. I did add an extra 2 ft pole to the sides and yes I do have a 18" gap at the bottom. I liked that setup but didn't want to have a building permit plus the cost was 4x as much. 10ft width is tight. Less than 1 ft on each side. I'm pretty good at getting it in straight though. I can walk behind the boat and in front with door closed. Because I have the Z-5 Rack, I did have to lift the door threshold another 6". I have had one very similar to yours going on 7 years now. Still have not had to replace cover and it has been awesome. I think I paid $1200 or so a t the time.